By clv4@duke.edu in Data and Visualization Services, Library on November 17, 2014 . 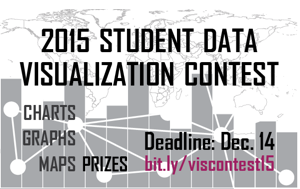 Duke Data and Visualization Services is now accepting submissions for the 2015 edition of the Duke Student Data Visualization Contest. All Duke students who have produced data visualizations for research, education, fun, or profit over the last year should consider submitting their best work. Winners will receive an Amazon gift card, and their work will also be exhibited in the Data and Visualization Services lab for the coming year. Submissions will be accepted until December 14, 2014, at 11:59pm. For details, see the full contest website. Questions? Email angela.zoss@duke.edu with any questions.